Nonprofits can look at threats in two ways: as a reason for fear, or as an opportunity to think creatively. Community Servings, which provides medically tailored meals to chronically and critically ill individuals and families in eastern Massachusetts, experienced the economic challenges facing most mission-based organizations during the Great Recession. Having formed to respond to the HIV/AIDS crisis of the late 1980s and early 1990s, we expanded our services to feed people with other chronic or life-threatening diseases—including diabetes, cancer, and renal failure, among others—ten years ago. The beginning of the Great Recession coincided with a period of programmatic expansion for us, which brought with it unexpected financial pressures. Just before the market fell out from underneath everyone, we had completed a capital campaign and moved to a new facility in Boston. To serve our new clients, we needed a bigger space, with a more modern kitchen to develop and cook our meals. The occupancy costs for the new building, opened in 2007, doubled from $83,000 a year to $165,000. For instance, we paid $2,500 a month for our electric bill in our former facility; in the new building, the bill is as high as $10,000 a month. To provide a sense of the size of our expansion, Community Servings’ operating budget nearly doubled from operating expenses of $2,763,561 in FY’07 to $5,047,423 in FY 13. So, just as we were facing increased demand and paying higher costs in order to feed more people, we were confronted by an economic downturn and a donor base that was taking a longer, more thorough look at where their dollars were going. We knew that donors wanted their resources to directly help the people we serve; no one wants to pay your electric bill. This combination of factors not only threatened us, it endangered the well-being of our clients, most of whom are gravely ill and rely upon our meal delivery service. So how did Community Servings survive and grow? Counterintuitively, instead of retreating, as many nonprofits did during the recession, we expanded once again. We realized we needed a “programmatic roommate” to share our overhead costs, so we expanded in a way that allowed us to access different resources without cannibalizing our core services or creating mission creep that would distract us from providing quality, tasty, and nutritious meals to sick people. For instance, recognizing that we had more space and a need for more hands to create our meals, we created a food service job-training program that brought trainees into the kitchen. 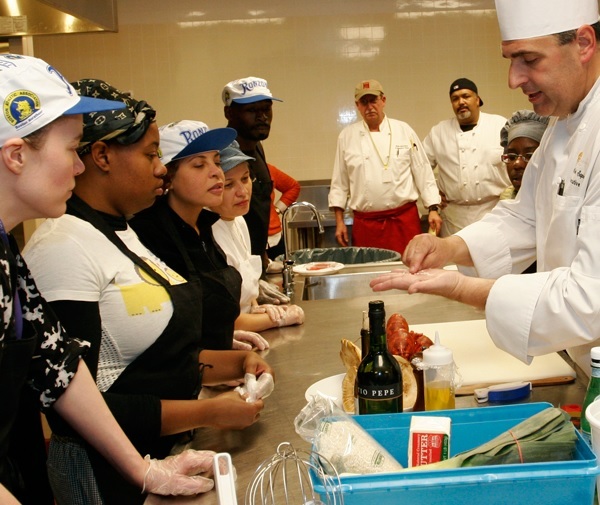 We were able to avail ourselves of free labor, but because we have strong connections to the restaurant industry around Boston, we were also able to offer our trainees both skills and career opportunities. As an organization that believes strongly in providing second chances, we specifically created a training program targeting ex-offenders. This initiative allowed us to access workforce development donors, strengthen our ability to create more meals for more people, and provide opportunities for individuals who might not otherwise have them, all without distracting us from our main purpose. Similarly, we created a local foods initiative—outreach to local farms and food producers—that gave us access to beautiful, local, free foods while also amplifying those farmers’ reach. Again, this allowed us to reach out to new donors who were interested in supporting local and sustainable foods, a population of donors who are different from those who are attracted to our work helping sick people. Not all of our initiatives worked. An effort to create a farmers’ market in our urban neighborhood did not get the traction we had hoped, so we ceased operating it after a few years. Additionally, we created a social enterprise initiative in which we began selling our excess meals to local parochial and charter schools. It is a great program, but we are at a crossroads in determining if it is a sustainable business. We survived the Great Recession, and continued steady growth at a time of great vulnerability, because we recognized that we could leverage our core competencies to access new funding opportunities. But we also understood that we could not explore those opportunities at the expense of our core mission. Instead, we had to identify new programs that could uniquely capitalize on our existing assets and further that mission. It required a full understanding of who we are and what we do, and careful thought—but also some vision and a willingness to take a few risks. As other nonprofits move forward, even in a recovering economy, we recommend the same approach. David B. Waters is the CEO of Community Servings in Boston, Massachusetts. With a staff of 39, the agency delivers medically appropriate meals to 1400 critically ill individuals and families per year across 215 square miles, having delivered 4.8 million free meals over 22 years. He has been honored by the American Marketing Association in the field of nonprofit marketing, and received the Hero Among Us award from the Boston Celtics and the Social Justice Award from Wainwright Bank. He is the former Board Chair of the international Association of Nutrition Services Agencies, and serves on the Mayor’s Food Policy Council and the Massachusetts Food Policy Alliance.